My position on mind and consciousness is a materialist position. A materialist believes that everything is matter, that there is nothing above or beyond matter, that mind and consciousness are matter or derivable from matter and physical laws. By “matter”, I mean “matter” in the very broad sense that matter and energy, wave and particle, are all material. The strict materialist position must be that there is nothing that is not matter. So even an emergent property such as mind or consciousness would also need to be material. If the materialist lets into his model anything that is not matter then the floodgates are open and there would be no reason to rule out a priori other non-material emergent properties – ghosts, spirits, God, or whatever. This is precisely Nagel’s argument in Mind and Cosmos – that is there is something about consciousness that is not material. So the strict materialist cannot argue that consciousness is non-material, even if it is an emergent property and dependent upon the underlying matter. Just arguing it is dependent upon the underlying matter isn’t sufficient. So what kind of material is mind? A key argument for the material view of mind has been general anesthetics. If we take a person and administer a general anesthetic, such as ether, consciousness is shut down. When the effect wears off, consciousness returns. The materialist can declare confidently that consciousness must be the product of brain chemistry. Roger Penrose and Stuart Hameroff make a twist on this argument. (1) The list of chemicals that can serve as anesthetics includes some very different chemical substances – ether, nitrous oxide, chloroform, and xenon. Xenon, if you remember your chemistry, is on the right hand side of the periodic chart with a group of elements called noble gases that include helium, neon, and radon. These gases are mostly inert – they react hardly at all with other elements. So how can xenon affect brain chemistry if it does not react with other elements? Here’s another interesting observation. Anesthetics administered to one-celled organisms, such as amoeba, at about the same proportional dose that would render a person unconscious, cause them to become immobilized. Are amoebas conscious? Penrose and Hameroff believe general anesthetics operate through van der Waals forces in microtubules. Van der Waals forces are weak attractions between molecules that are not chemical. Geckos, it is believed, are able to cling to walls and ceilings through van der Waals forces. Most molecules have an uneven arrangement of charges because of the way the atoms are arranged on the molecule. As different molecules come in close proximity these molecules can affect the shape and behavior of each other. 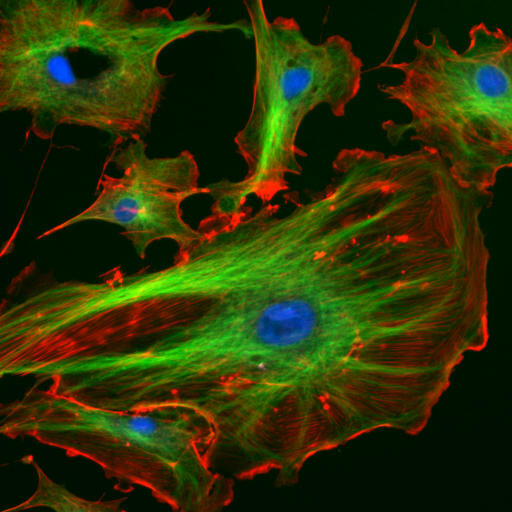 Microtubules are part of the cytoskeleton that is found in all cells. They are hollow tubes that consist of tubulin and have a role in transporting material in the cell, help to maintain the structure of the cell, and are the main component of cilia and flagella. Flagella are the small flipper-like structures that some one-celled organisms use to propel themselves. Tubulin is a fascinating molecule that grows and shrinks dynamically by itself. (Check out this video.) Penrose and Hameroff suggest that general anesthetics work by disrupting part of this process. So a disruption in the switching in tubulin could explain the immobility of the amoeba as well as the lost of consciousness in the human. We might also speculate that consciousness altering agents might operate though a similar mechanism but instead of shutting down consciousness they produce a modification of it. The differing effects of the various agents might be explained by different arrangements of the charges in the molecular structure of the agents. The significance of this is that consciousness does not reside in chemistry or firing neurons, though these things may be critical for consciousness to take action in the world, but in subtle electrical forces governed by quantum dynamics. What’s more it resides in an evolutionary old structure, the cytoskeleton, which may have been re-purposed from its functions in one-celled organisms to the provide consciousness to organisms with complex nervous systems. The cytoskeleton is a network of tubes and structures that is present in all cells. The cytoskeleton is most elaborated in eukaryotes, cells with nucleus, but the prokaryotes, cells without nucleus, also have analogues of proteins found in eukaryotes. The cytoskeleton consists of various kinds of filaments to provide shape and form to the cell in addition to the microtubules. Much research is ongoing in this area and much as still not known including the origins of the cytoskeleton. We might, however, speculate that form and shape in the organic has origins in fundamental physical principles that operate from the atomic level to the level of complex organisms and perhaps even to encompass mind and consciousness. Despite centuries of study, researchers still know relatively little about the forces that guide atoms to self-assemble into molecules. They know even less about how groups of molecules join together to create living cells and tissues. Over the past two decades, however, I have discovered and explored an intriguing and seemingly fundamental aspect of self-assembly. An astoundingly wide variety of natural systems, including carbon atoms, water molecules, proteins, viruses, cells, tissues and even humans and other living creatures, are constructed using a common form of architecture known as tensegrity. The term “ tensegrity” was first used by Buckminster Fuller and his geodesic domes are examples of its technique. The key to the technique is that structural integrity is maintained by dynamically spreading the load dynamically throughout the structure. As stress increases on the structure, it becomes distributed and no single point becomes a point of failure. Geodesic like structures can be found throughout all forms and at levels of life. The principles of tensegrity apply at essentially every detectable size scale in the body. At the macroscopic level, the 206 bones that constitute our skeleton are pulled up against the force of gravity and stabilized in a vertical form by the pull of tensile muscles, tendons and ligaments… In other words, in the complex tensegrity structure inside every one of us, bones are the compression struts, and muscles, tendons and ligaments are the tension-bearing members. At the other end of the scale, proteins and other key molecules in the body also stabilize themselves through the principles of tensegrity. .. Tensegrity can be invoked to explain more than the stabilization of cellular and nuclear form. For example, Steven R. Heidemann, working with Harish Joshi and Robert E. Buxbaum of Michigan State University in the mid-1980s, found that tensegrity can explain how nerve cells extend long, thin projections called neurites, which are filled with microtubules and transmit electrical signals in the nervous system. This growth is required for repair of nerve damage. Ingber points to the examples of fullerenes, viruses, enzymes, organelles, cells and even small organisms to argue that there is a universal pattern that is evidence of common rules of self-assembly. In particular, all these entities stabilize themselves in three dimensions in a similar way: by arranging their parts to minimize energy and mass through continuous tension and local compression–that is, through tensegrity. Could we also take the argument forward to understand how mind and consciousness came from matter? Could consciousness be a sort of dynamic balancing and optimal organization of something (matter?) in space and time? Could it in in a sense be just another structure such as fullerenes, cytoskeletons, and bones are? This is the ultimate materialist argument but it has buried within it a deep secret. There is really no matter. What we think is material is structure – from the atom to the mind. If consciousness is material then the material would be in some sense conscious. Consciousness is one of the optimal solutions for matter to organize itself in space and time. 1- Penrose, Roger. Shadows of the Mind.Oxford University Press, 1994. p 369-370. This entry was posted in Consciousness, Origin of Life, Quantum Mechanics. Bookmark the permalink. Jim, I totally can appreciate your blog on Materialism and respect your belief. My understanding is that above and beyond all material aspects of this Universe is an underlying and deeply permeating presence. It does not matter what you call it because it has no name it just IS. The other side of my point is… if you don’t believe its there then it isn’t for you. That is perfectly ok. Whatever you believe is your reality, Everyone here can believe and act according to their beliefs. Look at the way our world functions. So many different ways to look at ourselves and who we are as human beings. There are no arguments that need to happen and no one is wrong. We fight, we love, we kill, we cherish all within our belief system. It is what drives us, supports us and ultimately diminishes or elevates us. I appreciate your blogs, they make me think about myself. Sometimes I forget what I came from…and the spirit that drives my SOUL. Today you reminded me. Thank you. “Matter or substance necessarily presupposes the existence of force or energy. This does not mean that a dualistic conception of the world is necessary. The concepts of matter and force are as relative as everything else. In the Absolute, where all is one, matter and force are also one. But in this connection matter and force are not taken as real principles of the world in itself, but as properties or characteristics of the phenomenal world observed by us. To begin the study of the universe it is sufficient to have an elementary idea of matter and energy, such as we get by immediate observation through our organs of sense. The ‘constant’ is taken as material, as matter, and ‘changes’ in the state of the ‘constant,’ or of matter, are called manifestations of force or energy. All these changes can be regarded as the result of vibrations or undulatory motions which begin in the center, that is, in the Absolute, and go in all directions, crossing one another, colliding, and merging together, until they stop altogether at the end of the ray of creation. “From this point of view, then, the world consists of vibrations and matter, or of matter in a state of vibration, of vibrating matter. The rate of vibration is in inverse ratio to the density of matter. “In the Absolute, vibrations are the most rapid and matter is the least dense. In the next world vibrations are slower and matter denser; and further on matter is still more dense and vibrations correspondingly slower. “Thus instead of one concept of matter we have seven kinds of matter, but our ordinary conception of materiality embraces the materiality of worlds 96 and 48 only with great difficulty . The matter of world 24 is much too rarefied to be regarded as matter from the scientific point of view of our physics and chemistry; such matter is practically hypothetical. The still finer matter of world 12 has, for ordinary investigation, no characteristics of materiality at all. All these matters belonging to the various orders of the universe are not separated into layers but are intermixed, or, rather, they interpenetrate one another. We can get an idea of similar interpenetration of matters of different densities from the penetration of one matter by another matter of different densities known to us. A piece of wood may be saturated with water, water may in its turn be filled with gas. Exactly the same relation between different kinds of matter may be observed in the whole of the universe: the finer matters permeate the coarser ones. “Matter that possesses characteristics of materiality comprehensible to us is divided for us into several states according to its density: solid, liquid, gaseous; further gradations of matter are: radiant energy, that is, electricity, light, magnetism; and so on. But on every plane, that is to say, in every order of materiality, similar relations and divisions of the various states of a given matter may be found; but, as has been already said, matter of a higher plane is not material at all for the lower planes. “All the matter of the world that surrounds us, the food that we eat, the water that we drink, the air that we breathe, the stones that our houses are built of, our own bodies — everything is permeated by all the matters that exist in the universe. There is no need to study or investigate the sun in order to discover the matter of the solar world: this matter exists in ourselves and is the result of the division of our atoms. In the same way we have in us the matter of all other worlds. Man is, in the full sense of the term, a ‘miniature universe’; in him are all the matters of which the universe consists; the same forces, the same laws that govern the life of the universe, operate in him; therefore in studying man we can study the whole world, just as in studying the world we can study man. Here is what fascinating about what you posted. It seemed familiar but I couldn’t place it. Google helped out. It looks to be from “In Search of the Miraculous” by Ouspensky. Yes, I have read that but many years ago. I think I have a copy on my bookshelves, perhaps buried back in the second layer somewhere. Basically I agree with most of it. This seems to be another example of where I have absorbed something, forgotten about, then it comes back to me in some slightly modified or enhanced form without my recollection of it. To expand briefly on my reply to the previous comment, materialism when it reaches its extreme and strict form becomes a form of animism. Most who declare themselves materialists preserve unconsciously a dualism. They cannot go the full distance. Complete materialism becomes animism. Matter disappears and we can regard the world as either pure matter or pure thought. There is no difference. Indeed – I have written about this elsewhere, but I regard the renaissance alchemists as a further development of the ancient scientists and philosophers of greece (who gave us terms like “metaphysics”), and who took liberal cues from the priests of egypt and sumeria – both of who in turn were a further development of an ancient shamanistic practice. All these disciplines are characterized by study of (and participation with) both the mind and natural world, and particularly the relationship between their inner workings. Human life is not regarded as separate from the world itself, but rather a certain focal expression of it, among endless others which all exist in a continuum together, which is itself “the world”. The passage quoted above refers to a lecture given by Gurdjieff, as transcribed by Ouspensky (which is the majority content of that book.) His system could be considered as a modern example and development of alchemy, and often acknowledged the other underlying influences described above. And this is only in regards to the views of a portion of western society, for the most part skipping the celtic and nordic streams which are entirely and outright animist. Eastern societies also contain various manifestations of this same view – notably taoism and various tantric, vedic and vedantic philosophies of india, but also lesser known examples such as sufism, jainism, shinto, and so on. The essential basis has many manifestations and resulting perspectives in many different cultures. There is a great deal of profound knowledge and information from ancient times that reaches down to us in seemingly obscure or even nonsensical forms, simply due to our lack of cultural context particularly in regards to the prevailing consensus understandings and references of a certain period of time. It is a broad based phenomena that is not limited to philosophy, science or any other field. Even newspaper articles about various events from 100 years ago can give clear evidence of this kind of disconnect. If we can somehow circumvent this seemingly requisite rebuilding of the wheel, time and time again, it will be greatly advantageous. There are many, many generations of giants we could be standing on the shoulders of. Tiger, can you point me to where you have written about this? I would be interested in reading. My own view is the science is in fact leading us to a sort of modern animism and that eventually science and religion will be reconciled. This might be a sort of modern alchemy. This posting contains a fair amount of self assembly within it also. You present several key ideas in a well constructed framework, and the central theme self-assembles in the minds of your readers. There are many parallels in the temporal domain which you illuminate handily, and the materialism you speak of reminds me somewhat of the naturalistic theory of consciousness expressed by David Chalmers. Matter may self-assemble and certain properties may emerge naturally from those conglomerations of cells and systems, but determining how it is possible that matter is able to “organize itself in space and time,” is really only one aspect of the equation. It seems entirely possible to me that whatever material mechanisms are found to be responsible for everything we see and experience as temporal creatures–beings who are every bit as much a part or parcel of the universe as the atoms and molecules–we are still left with aspects of our existence that are not satisfactorily explained by those mechanisms only. It may be that we simply don’t fully understand how matter manifests in the material world, and maybe even Ouspensky’s ideas about the “laws and forces that govern everything from the creation of galaxies to the movements of atoms to the energy transactions within the human organism,” are only able to explain the way the universe appears to work, but regardless of how a full understanding of consciousness might eventually “self-assemble,” in our minds, we know with certainty that forces and energies which are unobservable do exist. We infer their existence by a number of different methods, and the materialist view is one of them. I admire your work in your blog very much and appreciate your willingness to engage with others on a most challenging area of understanding. That is absolutely the case now. I believe as we get closer to understanding those mechanisms they will begin to appear less and less like what today we think of as materialism. I am putting together a project now, an edited volume on machine ethics, and wonder if you would want to articulate your position (basically a representation of this post and comments thread) as a chapter of the text? This would fit the final volume very nicely. Please consider replying asap if interested. Thanks for your patience! It would be lucky for us that the brain used principals in quantum mechanics! I would think that the brain is more like a quantum computer. If nature could build a computer on the quantum scale, then it would be only natural that it would take full advantage of it. Hopefully, amoeba are not self aware. Any time we used a strong cleaner, it would make us mass murderers. I think it may just be details that science has not yet dove into deeply enough to understand these types of biological movements. It may just be a part of the big picture that is missing from not being able to conceptualize every single variable involved. One thing about our minds has always stuck me as peculiar. Our minds need to dream in order for us to be rested, but our dreams would require work in order for us to experience those dreams. It makes me think that material things are not the only things at work here. If material things do work, they get tired, not rested. My argument has been that consciousness and mind are material but the material of which it is constructed, perhaps the “matter” of the universe, isn’t what we think it to be. When we enter the quantum world, matter seems less and less like matter. Dreams do seem to pose a conservation issue. The only proven instance I know of where conservation is violated is in random particle pair production. Then I have noticed that a lot of people have not accepted this fact. If you start out with nothing, then a particle and antiparticle pop out of nowhere and annihilate, then you are still left with a photon that came from nothing initially. It makes me wonder if being tired actually represents a lack of energy in the brain, because of dreams being able to do “work” to alleviate that tiredness. This may actually seem a little crazy. Actually it is a lot crazy. In my younger years, I experienced deja vu very frequently. I tried figuring out what caused it. I started to realize that the experiences I had deja vu with came from my dreams. If I made a point to remember some of my dreams, I would experience them later on in life as an instance of experiencing deja vu. I started some experiments of my own dealing with it. I made the commitment to myself that if I had deja vu that I would think or say, “woh, I just had deja vu”. Then if I had a dream that was a deja vu experience, I would know it because then I would think or say, “woh, I just had deja vu”, in that dream. Then I would know what dreams I had where of the future. As time went on after my dreams about deja vu, I would more often than not forget about having those dreams before I experienced them in real life. Then if I tried to avoid those circumstance, I would unwittingly still put myself in those circumstances even though I tried to avoid them. It was like being trapped in a self fulfilling paradox. It got to the point to where if I thought I would try to say or think something else, I would end up thinking or saying that in my dream initially. That is not to say that what I dreamed about having deja vu always ended up happening exactly. The more I toyed around with it, things started to become off balance. Like, when I was experiencing it while watching T.V. one time my little brother walked by the doorway while I was watching a commercial. For the first time a strange thing happened, and I saw my brother walk by but the commercial didn’t come on until several seconds later. Then the more I experimented with it, the less often it began to occur. I tried finding a logical explanation for all this, and it lead me to believe that maybe quantum superposition could be responsible for allowing this to occur, and quantum superposition is in multiple points in time as long as space. Honestly, if I hadn’t had this happen to me and I was you I wouldn’t believe any word I said. It really lead me to think that dreaming may just clean up after the quantum fuzziness that ends up filling up our brains. Then we dream just to get rid of this fuzziness, and that is how dreaming makes us no longer feel tired. Then our brains being tired isn’t actually due to a lack of energy. It is due to a build up of quantum fuzziness in our heads. At the time, and it still does, seem like a lot better explanation than I have just become one of those crazy people that have become delusional or make up wild speculations and fantasies. Oddly enough, I was exposed to radiation as a child that was buried near the street I grew up on. Then other people I grew up with shared these experiences, and we would have instances of deja vu simultaneously. Then it is known that particle decay can happen randomly in time. I was diagnosed twice growing up with chronic bronchitis that can be caused by radiation at that age. Then I have more recently been diagnosed twice with no longer having it, and it is a disease that is supposed to be a permanent condition. Then my lack of symptoms have coincided with my growing lack of deja vu experiences. It may have something more to do than with just the brain itself, like temporal symmetry. My decline in experiencing deja vu could be caused by the alteration of the particle decay that gave me this illness, thereby changing it from ever happening. Unfortunately, the things I had dreamed about having deja vu about where never any real significant event. Most of the time it was just about me standing around or driving somewhere. It never allowed me to save someone from a crisis or win the lottery. Then I guess that would have to have been something I would have been doing in the first place. Honestly, I hope that the condition doesn’t come back one day. I use to start this post. You might be particularly interested in The Tibetan Yogas of Dream and Sleep.